“Tafa is very important to us because of the number of big trucks that park and operate there. It is the gateway to Kaduna from the FCT and a lot of retail businesses are ongoing there. “As the rains are going, the risk of lassa fever is very high and close communities like Tafa are quite vulnerable. “Also, we do not want the fire outbreaks that happened before to repeat itself as the refuse will cause greater havoc if there is a spark. 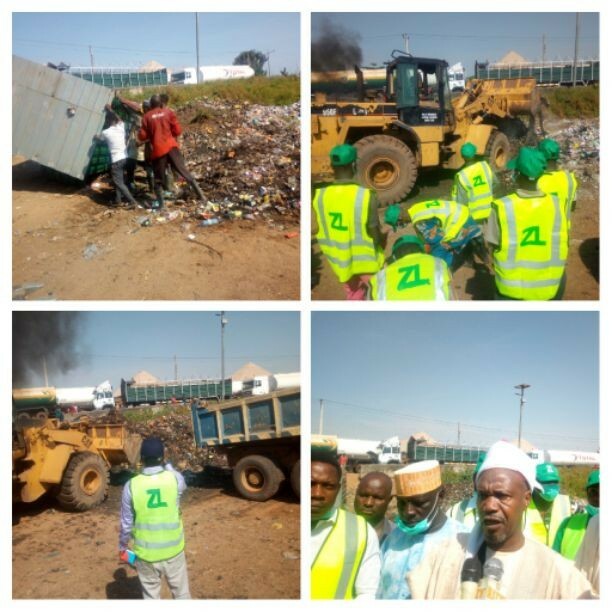 The above were the words of Managing Director and Chief Executive Officer, Z L Global Alliance – Nigeria, Abiola Bashorun on the evacuation of hips of refuse at Tafa-Jere in Kagarko local government area of Kaduna state on Tuesday, November 13, 2018, as part of Corporate Social Responsibility (CSC) of the company to the community. Tafa-Jere, Kagarko local government area of the state shared boundary with the Federal Capital Territory, Abuja and Niger State and about 100 kilometres from Kaduna, the state capital. Represented by the company’s Head of Operation, Joy Ogenyi, Abiola Bashorun added that, this was the third time her company would be doing this in the area. To be able to manage the refuse in Tafa-Jere reasonably she said, the state government may add the town to ZL Global Alliance’ franchise areas while calling on the federal government to compel heavy-duty vehicles drivers to make use of park provided for them instead of packing on the roadsides. “We look at the areas of need in the state and see what we can do in terms of friendly environment especially health issue and welfare of people around such areas which is part of our CSR. “This is the third time we would be doing this. We did it last two years, last year and we are doing this now. We are working in the state and we felt it should be done. “We have spent a lot of resources though I may not be able to give the figure off hand, but when you look at the equipment and the personnel deployed for this special operation, you will see its in millions and if government is ready to extend our services to the area, we are up to the task”, she added. Speaking for the community earlier, Marafan Jere, Alhaji Garba Usman said, as traditional leaders, “we will continue to sensitise our people about the danger associated with indiscriminate dumping of refuse to us especially, our children and nursing mother’s who were majorly at the receiving end of disease outbreaks for example. So, we thank this company for coming to our rescue again as we have witnessed sometimes in the past. “We are aware the federal government provided a place for the trailers and tankers and for sometime, they were nor here and the area was a bit save from refuse. But maybe, they were not adequately guarded, they are back here and also the refuse.